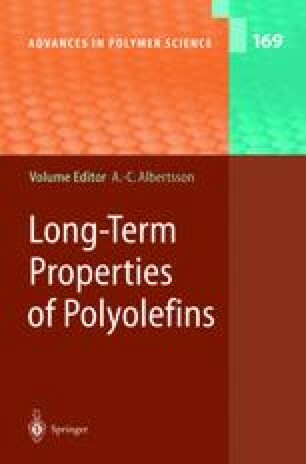 The fracture properties and microdeformation behaviour and their correlation with structure in commercial bulk polyolefins are reviewed. Emphasis is on crack-tip deformation mechanisms and on regimes of direct practical interest, namely slow crack growth in polyethylene and high-speed ductile–brittle transitions in isotactic polypropylene. Recent fracture studies of reaction-bonded interfaces are also briefly considered, these representing promising model systems for the investigation of the relationship between the fundamental mechanisms of crack-tip deformation and fracture and molecular structure. The author acknowledges the technical support of the Centre Interdépartemental de Microscopie Electronique (CIME) of the EPFL and H.-H. Kausch, J.-A.E. Månson, C. Grein, P. Béguelin, R. Gensler, C. Creton, F. Kalb, L. Léger, A. Ghanem, A. Goldberg, P.-E. Bourban, G. Smith and many others for the opportunity to be actively involved in various aspects of this work.